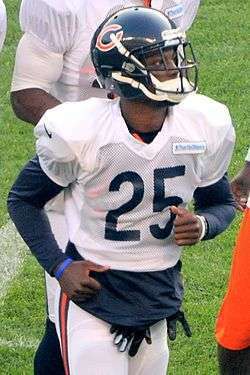 Wilson at Bears training camp in 2014. C. J. Wilson (born November 18, 1989) is a former American football cornerback who played for the Tampa Bay Buccaneers in the National Football League (NFL). He was signed by the Chicago Bears as an undrafted free agent in 2013. He played college football at NC State. He was also a member of the Tampa Bay Buccaneers. On April 28, 2013, Wilson signed with the Chicago Bears as an undrafted free agent. He was waived on October 28, but was brought back onto the practice squad. Wilson lost two fingers in a fireworks accident on July 4, 2015. On July 24, 2015, Wilson announced he was retiring from the NFL due to his injuries. ↑ "Bears sign 10 undrafted free agents". csnchicago.com. Retrieved April 28, 2013. ↑ "Bears Sign Jordan Palmer, Make Several Other Roster Moves". WBBM-TV. October 28, 2013. Retrieved October 28, 2013. ↑ "Report: C.J. Wilson lost two fingers in fireworks accident". Profootballtalk.com. July 8, 2015. Retrieved July 8, 2015. ↑ Hanzus, Dan (July 24, 2015). "C.J. Wilson steps away from Bucs after fireworks injury". NFL.com. Retrieved November 14, 2015. ↑ "Bucs' C.J. Wilson retires after July 4 firework accident". FoxSports.com. July 24, 2015. Retrieved November 14, 2015.